This peeling is based on alpha hydroxy acids (glycolic acid and lactic acid) in combination of high concentration of vitamin C in its natural form (ascorbic acid). The vitamin C is kept stable as a dry powder during storage and incorporated into the preparation just before use. This ensures purity and maximal activity of vitamin C. The product contains also high concentration of urea to enhance its action on the skin and extracts of Aloe Vera and Calendula flowers to calm the skin. The peeling is suitable for all skin types (excluding sensitive or irritated skin) for restoration vitalization and for preparing it for deep cleansing. It also gives the skin a splendid radiance, a special smoothness and enhances its tonus. This product is for use by professional beauticians only. In order to obtain effective peeling combination of alpha-hydroxy acids and vitamin C: mix well (just before using the peeling) one tea spoon of Professional Peel Powder with two tea spoons of Professional Peel Gel. Apply a thick layer on the face (keep away from the eye area). You may cover the face with nylon pads for better results. Remove and rinse thoroughly after 7 minutes. Do not use this peeling on an irritated skin or on a sensitive skin or after exposure to the sun. After the treatment it is advised to use Cactus Calming Gel for calming the skin. Use sunscreen in case of exposure to the sun. Keep away from eyes. Not to be used for children. Keep out of reach of children. Deep cleansing (black heads) - easy and painless . Enhanced absorption of active ingredients. Leaves the skin smooth and radiant . 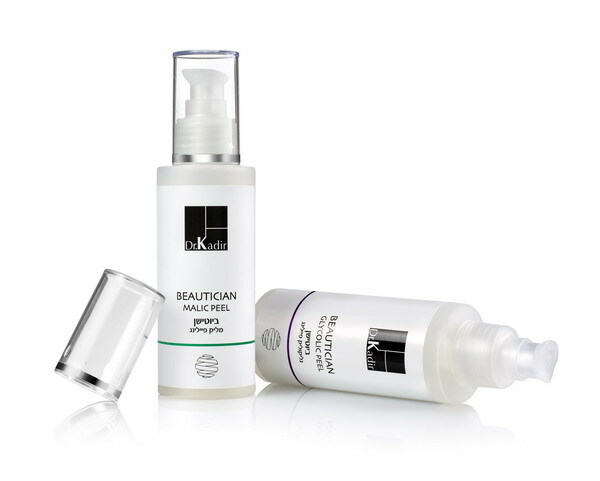 The products based on a combination of malic acid with salicylic acid (Beautician Malic Peel)or a stronger combination of glycolic acid with salicylic acid (Beautician Glycolic Peel). Unique water free formulation with free active alpha and beta hydroxyl acids. Immediate sensation of activity and warming without irritation.